My brother had a co-worker that needed to get rid of one of her hamsters due to the fact that they didn't get along. She asked him if he'd take one for her so she knew the hamster would go to a good home. When he brought the hamster home, it was the cutest grey hooded mottled campbell's russian dwarfie I'd ever seen! But the hamster was so mean! You couldn't hold her, she would bite and spend most of her time biting the cage bars and smacking her body against the cage when someone would walk by her. The next thing my brother found out was that his co-worker got rid of her other hamster because she didn't want them anymore and she had duped my brother into taking the hamster. She also admitted to abusing the hamsters by torturing them mentally. They didn't like each other and she would put them in the same hamster ball just to watch them fight. And she would take a ruler and run it along the cage wires to irritate them and spray them with water with a spray bottle when they made noise. She was horrible to them!!! So now I understand why this hamster was so mean and hated people. A friend of his younger brother was turning 12 and they decided that they would give the hamster to him for his birthday since he was old enough and he wanted one. A few days from then when my brother was going to clean the hamster's cage, he was about to put the hamster into a tall clean bucket for safety when the hamster decided to suddenly bite my brother extremely hard and then jump for her life. My brother tried to catch her but she landed on the left side of her causing her right eye to pop out of her head. She fell into the bucket and started walking around with her head down on the ground in a circle. We took her to the vet right away. The vet put her eye back in and sewed it shut, with a 50% chance of the eye surviving. I took the hammie home with antibiotics and knowledge that the hammie was now mine, and she would kinda walk a bit funny from having a concussion and surgery. The first day I was to let her rest as much as possible but then try to get her to move around to get the anaesthesia out of her system. So I would get her to get on the wheel and slowly move and would even use treats as bribes sometimes. I felt so bad but I knew it was necessary for her health. Eventually, I took the hamster back to the vet for a check up on the eye and it turned out the eye didn't make it, it detached from the optical nerve and died so the lids stayed shut. But I was fine with my little one-eyed hammie. She was healthy and ok. I finally named my hammie Poop. I named my hamster Poop because this funny hamster would poop when she would wake up, eat, drink, sleep, run, was happy, mad, sad, play, you name it my hamster would POOP! I had never known a hamster that pooped THAT much. If my hammie didn't poop 3 poopies in 15 seconds of being active and awake there was something wrong. It took me a month or so taking many hamster bites and scratches and hisses and smacks at the cage before my new hamster finally trusted me to just hold her. One day as I�m was holding Poop, checking out the anatomy of a hammie, I noticed this funny little belly button but it's slightly lower than it should be. I had this funny inclination to ever so gently press on either side and OMG! Poop's a dude!!! So me and my handsome hammie Poop were always together from then on. I was able to get him to jump onto my hand when I put my hand in the cage, he'd sit on my shoulder and I could walk around the house and he'd just take a ride (I�d walk very, very slowly) and he'd even sit on my keyboard while I�d be on the computer. I ended up needing brain and spinal surgeries a year later and my little Poo was the only pet I was allowed to have in my room and handle at the time. I had dogs too but they were on the large size and I couldn't have them all over me. I lost a lot of my friends but gained a few new ones through the hamster community. My main companion was my little Poop through the whole thing. When I was getting better, I was out shopping for some litter, hamster food and treats for Poop when I came across this poor little hammie girl (female for sure this time!) in a tank with other females being beaten up! She was this tiny little thing, a siberian winter white, and all the bigger ones were chasing her away. I bought her and brought her home. 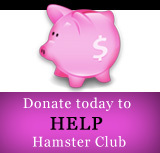 Her legs were limp-like from the other hamsters biting them and most-likely crushing her poor little legs. When she walked, her legs swung around like weak frog legs. It was terrible. The next day I happened to turn her over to examine her better now that she was better settled in and I started to cry, she was so torn up. She was all bloodied, she had fur missing you could tell that her legs weren't right. I took her to the vet and I showed the vet what I had found and asked if she was going to survive. The vet didn't charge me because I had just adopted her and found out how badly damaged she was and brought her in right away. She gave me antibiotics and said she was taken away from her mother too soon, she was most likely trying to suckle on the other females and they were chasing her away for that reason. She wouldn't walk right but she would be ok and to just treat her gently until she heals. I named her Nibbles because she liked to gently nibble my fingers. She was so tiny, that I had to crack sunflower seeds open for her because she couldn't do it herself!!! So very tiny. I made sure she got exercise for her legs too. I got her on her wheel several times a day as physical therapy and she became the fastest winter white ever! She grew into a beautiful full grown hamster, gorgeous coat and Poop seemed to really like her so I decided to see if they would like to mate, after she was old enough of course. And they did. I monitored her pregnancy very carefully, made sure she had plenty to eat, lots of water and tofu for treats. She went into labour and I even watched when her water broke. It was an exciting moment for me. I had read everything I could on what to expect, how long it should take and everything. When the first pup hadn't come by 20 minutes I knew something wasn't right. I don't want to go into details because it makes me very sad. I didn't know that while you can breed winter white males with campbell's females you can NOT breed winter white females with campbell's males because the pups are too big for the females. 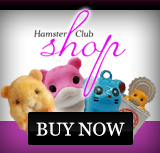 It was a horrible ignorance that cost my hamster's life. She bled to death in agony trying to give birth to a breech pup that was just too big for her. I took her in but it was too late by the time I took her in. The vet thought they had it all under control and they were set to release her but when they went back to go get her she had died. I knew the pups hadn't made it but I was devastated when they told me Nibbles was gone. It was the first time for me to lose a pet. It was hard on Poop too. I went home and cleaned her cage because it had birth blood everywhere plus she was no longer with us. Poop got very depressed. I read that when they lose a mate they can die of depression and I was scared he'd just give up on life. I was so glad they hadn�t bonded. He was head over heels of her but she was like eh, whatever when it came to him. I felt so bad for him when he tried all his tricks like making nests out of litter and rubbing his belly and spreading his musty smell and cleaning himself up to look all handsome ;) And there he was just lying on his wheel, not moving, day after day after day. It was so sad, but I knew he had to grieve too. I would just pick up his little limp body and pet him and let him know that I was there and cared and then put him back on his wheel. Eventually, things got better for both of us. I had finally healed up from my surgeries and could walk on my own again. By now my Poo was almost completely blind due to his accident. He seemed so lonely so I decided it was time I got him a mate. I saw this cute little white campbell's russian in the store; brought her home and I named her Chitter Bug. Once again Poo was having no luck with the ladies but somehow they had 9 pups. 3 died because they were anophthalmic but the rest were perfect, 5 girls and 1 boy. I named one Baby Poo because she looked exactly like her PaPa but she was brown hooded mottled instead of grey hooded mottled. She was adorable. At the age of 5 months, she had a seizure or stroke or something of that nature and when I took her to the vet, they tried a few things and said that was the most likely thing that happened and she wasn't responding to anything so I had to put her down. I was very sad and so were all the other hammies, Baby Poo was a very special little hammie. When it was time, I was able to pair Baby Poo's cage mate with the runt who was still with her Mama at the time. Funny enough in the beginning... poor Poop, when his mate Chitter Bug chased the only boy Cocoa, out of the nest, I think because his scent changed from pup to more of a male, I put him in with his father but Poop was scared of his tiny little cage mate!! I gave it a few weeks while I had to finish weaning Cocoa off milk because he was still too young to be on just solid foods. They all had very individual personalities and I loved every single one of them for very different reasons but I think Poop will always be my favorite. We had the most time together. He finally went completely blind but he would still "look" at me but I think he did so using his heart. One day as I was writing a letter, I noticed he did a pee pee on the paper. I thought he may have just had a bladder infection but still off to the vet to get the necessary treatment. I got the most devastating news yet for me.. he had congestive heart failure... I had to put my hamster down. My heart dropped into my stomach, my throat swelled up and I stopped breathing. Not my first hammie, furry little best friend, it's the first time I have to make this decision, not him!! I knew I had to and I knew it was the right thing to do. I didn't want Poo to suffer like that. So I said goodbye to him and let him go. I asked for him to be cremated so I would always have him with me and I still do.